Shampoo and Conditioner. Can’t live without them. Especially when one pair in particular makes your hair look like it came out of a high-end hair commercial. Some, of course, promote themselves as helpful and a smoothing sensation results after using it. But, unfortunately, a lot of hair shampoos and conditioners give out a lot of promises that they don’t end up accomplishing. That’s until I discovered Nubi Hair. It’s Nourishing and Moisturizing Shampoo and the Nourishing and Moisturizing Conditioner were the duo I never thought I desperately needed. It’s a combination of amazingness and wonder. It gives you the feeling of a Super Model walking into the runway. Hair on point and flowing beautifully in the air. And let’s add that I got to not only use these babies, but I also added a hair product tool as well: The Grand Curler 18/25mm. How did my experience go? Well, let me spill that tea. First off, I normally use a local-buy type shampoo (Suave, Dove, etc.) so I’ve never really looked into Shampoos and Conditioners from other high-end brands. Especially if they’re out of my price range. But I wanted to try something completely new to me, that’s why I ended up giving a chance to Nubi Hair. This brand is based on not only on hair care products (shampoo, conditioner, hair serum, etc.) but it also features a big variety of hair tools as well. Moisture is very important, not only for your skin, but for your hair as well. A lot of us may have a scalp that does not produce natural moisture and do to that heritage we can end up having a dried scalp. Sometimes it can even be because of our aging. Yes, another reason we have to worry about as we keep aging. With time, we start to lose moisture. So, it’s important to keep in mind the hair and beauty products we use and its ingredients, benefits and, among everything, results. No one wants to leave the house with a dried looking scalp. One’s scalp should always appear and be as moisturized as possible. Having that feeling of beautiful looking hair is a great moment in life itself, so why worry about those dried up scalps. This problem can be and will be fixed with the help of two hair products: Nubi Hair Moisturizing and Nourishing Shampoo and Conditioner. 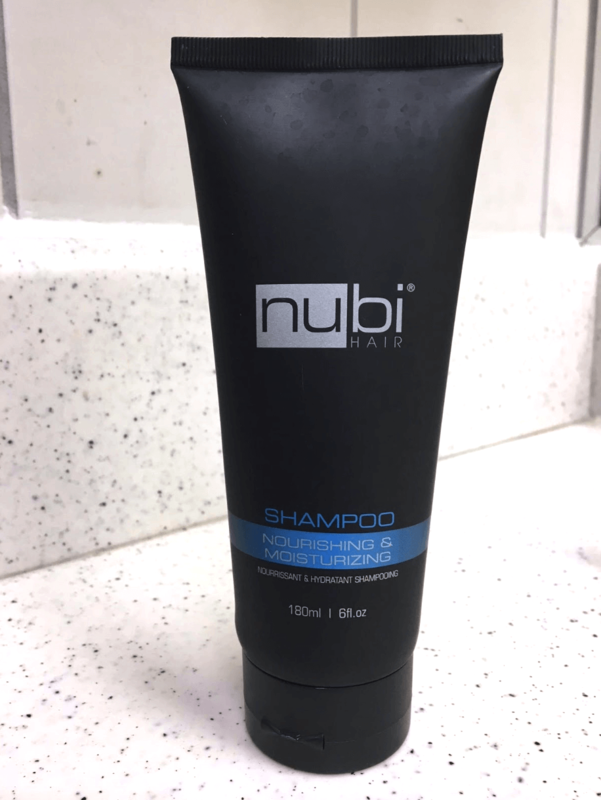 The Nubi Hair Shampoo is created to smooth the fibers of the hair so it becomes easier to untangle, having it feel silky and with a shinier look. This product is enriched in proteins from olive oil and plants and as a concentrated treatment it hydrates from our root to our tip to repel that missing hydration. It also calms frizzy hair and a static-making hair is prevented, making it easier to detangle. Some shampoos that I’ve used in past have left my scalp very dry. I won’t be mentioning the names of the brand, but I will say that it’s a very awful experience. Having a dry scalp is messy, embarrassing and not attractive. Why? Wel,l it creates dandruff and it doesn’t allow your hair to have a silky styled look when using heat tools like straighteners and curling irons. It’s a complete mess and the best idea to resolve this, in my opinion, is to change the shampoo you’re using immediately. 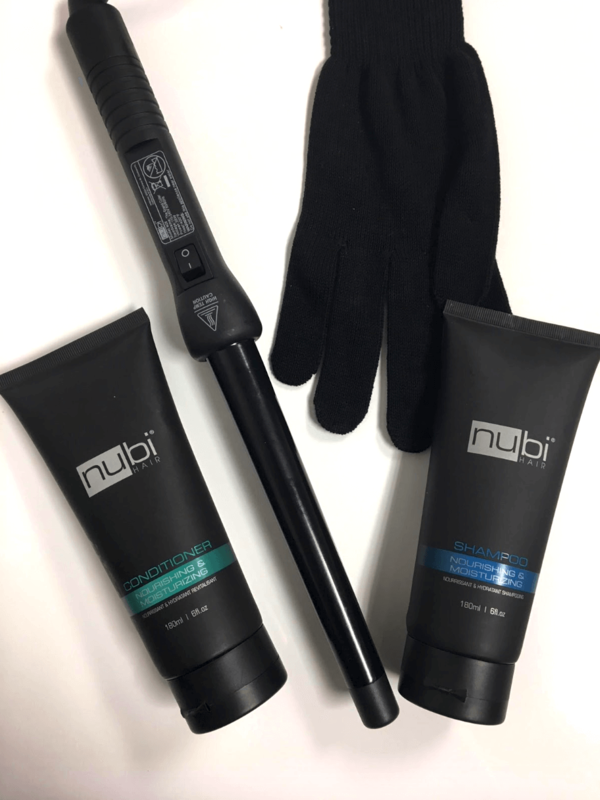 The Nubi Hair Conditioner, on the other hand, helps out the Nubi Hair Shampoo as a “you can’t mess with us” duo. Yes, I said that. Or in this case, wrote that. Bear with me. This product is also rich in olive oils and proteins. This unique combination helps with nourishing the scalp and delivers moisture against dehydration and the hair’s breakage. This can help repair hair structure, also helps calm frizz, energizes the hair and its shine is restored for incredible healthy-looking results. So, after learning the benefits and importance of a good hair conditioner, I changed my mind. Let’s emphasize the word I mentioned: good. Unfortunately, not all hair brands deliver the same good results. For this specific moment it’s important that you recognize and know how your hair works. Some hairs are naturally oily, dry or very moistured. So, we wouldn’t want to over moisture or damage the hair. My hair in particular, for example, is very oily so when looking to buy a new shampoo and conditioner (sometimes) I look for more “botanical” ingredients than scientific weird sounding ingredients. 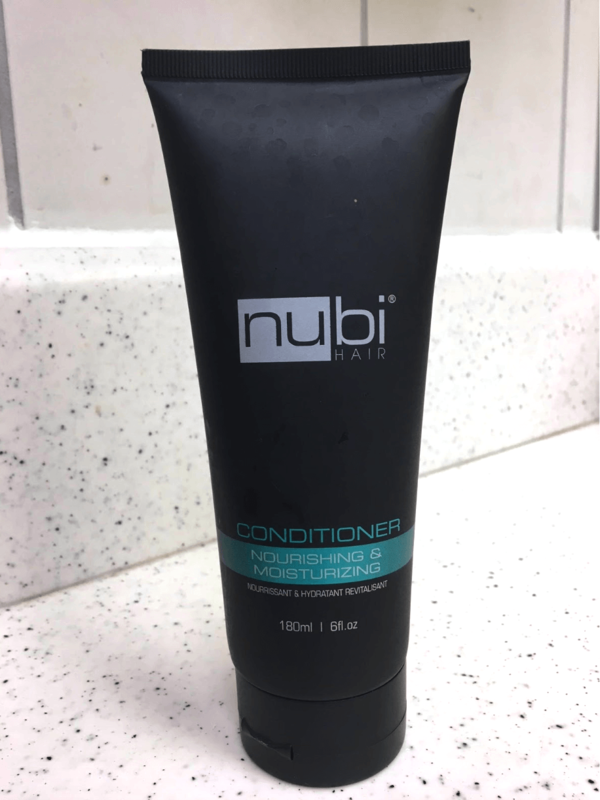 This is one of the main reasons I decided to try out the Nubi Hair shampoo and conditioner, to see if they actually moisture and nourish my hair. To me at least it’s really important that my hair looks good at all times. I’ve had moments when I was younger when a lot of shampoos were too harsh on my me and the dandruff was everywhere. There were moments where I felt uncomfortable in school and around my family. And I wasn’t the type of teenager to use a lot of hair products, so my hair wasn’t damaged all the time with hot tools. I began using the shampoo and conditioner one night that I decided to pamper myself, because everyone deserves one of course. Now, after showering and using both products, the first thing I noticed was that my hair smelled really nice. It had this soothing smell of Nature or something. I’m not kidding. It was a very attractive smell. It felt soft instantly and combing it was super easy. The conditioner had a really big effect on my hair because usually it gets tangled easily. It felt lighter on my shoulders and between the smell and softness, I couldn’t be happier. These were the types of hair products I needed as a teenager. My hair texture was different, the tips and frizzes were also controlled. My hair is naturally a bit greasy, so I was worried the shampoo and conditioner combined were going to be too much on me. But was I wrong. These two products are recommended to be used daily even. I wouldn’t use the conditioner all the time, but it is an extra plus when wanting an even softer look after showering. It was one of those moments where I was completely confident in myself. I didn’t have to stress about having a “good hair day“. I went out that same day to a dinner party I had planned with some of my friends and I didn’t even have to style my hair. When I mean ‘style’ I meant using a hair tool. It felt so naturally pretty and soft that it didn’t need styling. But that doesn’t mean that it’s not necessary. It’s always up to yourself if you want to style and prepare your hair a different way. You can use a straightener or curling wand. Speaking of curling wands, after trying out the shampoo and conditioner about a week or so later I decided to style my hair using the next product of this review: The Grand Curler. 360° Swirl Cord: This long cord helps to prevent any mishandling of the product. It allows you to style and prepare your hair without getting yourself tangled or uncomfortable. 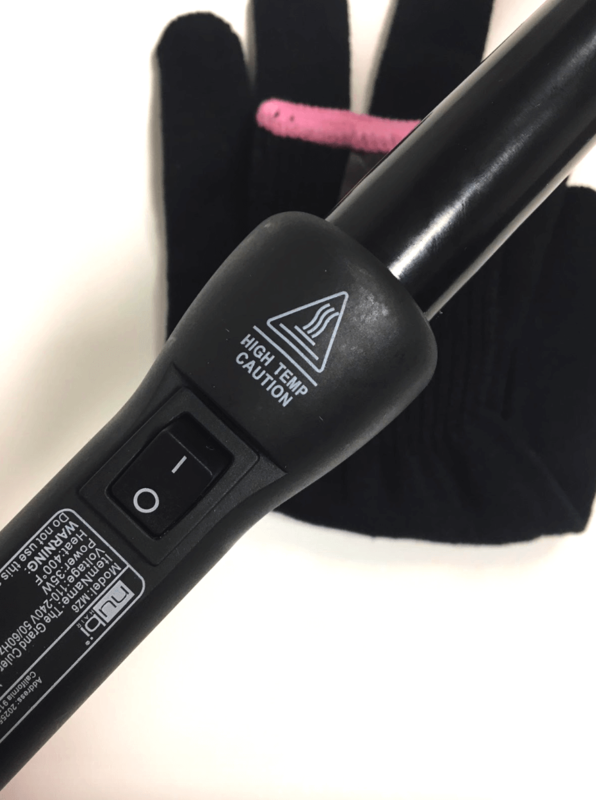 400°F Temperature: This temperature is the maximum capacity for this styling wand. Clipless Style: Some curlers may provide the help of a clip, so you can clip-on your hair so you can style It better. But, in this case the Grand Curler is a clipless styling wand that allows you to style easily without a clip. Teflon 18/25mm: One of the reasons this styling wand doesn’t present a clip it’s because of this specific feature. The Teflon barrel (18/25mm) allows you to get endless results without having your hair get stuck or brake. The Teflon helps with styling, managing and allowing the hair to stay on the barrel without creating frizzes and unnecessary breakage. Negative Ion Technology: This feature is also another way to prevent frizzes and split-ends. It helps to control the positive ions from creating frizz and it helps with the product’s heat as well. 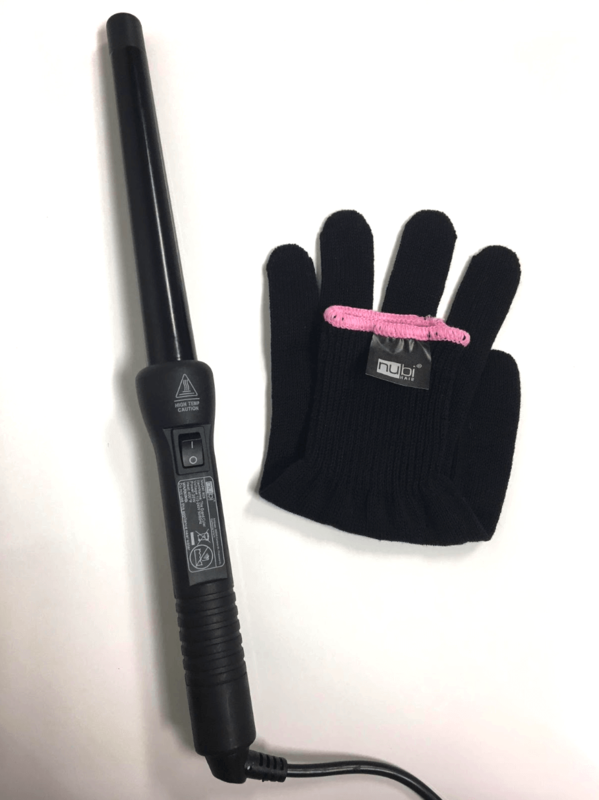 Easy Grip Handle: The wand grip is an easy-handle grip that helps you manage and create movements while styling your hair without worrying about burning your hands. On/Off Switch: Easy on and off switch that heats up and un-heats itself in seconds. For All Types of Hair: What’s great about this wand, unlike other styling tools, is that it allows endless styles for every hair type. No matter if your hair is thick or thin, wavy or straight, this wand will get you the curls we all desire to achieve. Quick Heat Recovery: Worried this tool will take forever to heat up or un-heat? No need. This tool will heat and un-heat itself very fast, so you won’t have to worry about running late to work or that special date. Glove: Now this is a mega help. Sometimes when we have to work with hot tools such as a curling wand, it gets difficult sometimes because when touching the hair when you’re styling can get uncomfortable because of the heat. Well, not anymore, because this product brings a glove to help out in this department. This glove allows you to touch the hair that will go around the barrel without frizzing it or getting it tangled. I decided to create some natural looking curls, which means that I created curls that I can comb afterwards and not lose them at the same time. To say that I was excited about my curls in an understatement. I was ECSTATIC. I looked like a million bucks. I looked like I came off a runway, so yes, I was pretty excited. I was happy because I didn’t have that frizzy hair all over my head like I’ve had in previous styles. It felt soft and manageable. I didn’t even have to overdue my make-up, because my hair was more than enough. This product allowed me to create the style I wanted without damaging my hair and, of course, the shampoo and conditioner are not left behind either. These three products are the friends you actually need to boost up that confidence. This entry was posted in Reviews and tagged hair care, hairstyling, hairstyling tools, Nubi Hair, product review. I went to the mall and the girl made a sale .but I got the shampoo and conditioner. I also got a straight iron for 95$ .I feel I got took when the shampoo and conditioner is only 5$.How can they do that if it only 5 dollars very upset. Actually I think you got a deal! On the website it says that the shampoo and conditioner are $25 each and the straightening iron costs $250. If you’re not happy with your purchase, you might want to try contacting them directly? It looks they have a contact page here.